The Criterion Collection continues to be a great resource for anyone who wants to expand their knowledge of worldwide cinema. Gathering classic films from around the world, from every genre and every era, Criterion has helped to show modern audiences that there has always been a vibrant film-making culture outside of Hollywood and that it is just as influential on the movie-makers of today, if not more so. A particularly huge chunk of Criterion’s catalog is devoted to the many film-making movements that arose in Europe during the post-war years. Many of these films are fascinating because each of them perfectly represent the changing cultural landscapes of their selective countries as they began to rebuild and define themselves in the later half of the twentieth century. We see the rise of Neo-realism emerge out of post-war Italy thanks to films like Bicycle Thieves (1948, Spine #374) by Vittorio de Sica, the emergence of the French New Wave with Breathless (1960, #408) and The 400 Blows (1959, #5) by Jean-Luc Godard and Francois Truffaut respectively, as well as the rise of New Swedish CInema with Ingmar Bergman and his classic The Seventh Seal (1957, #11). But, not all of the movements of this period represented a complete break from Hollywood for most European filmmakers. Some of them found inspiration in the films being made across the pond and tried to use many of the same techniques and apply them to stories that hit closer to home. And this was especially the case with filmmakers who intended to use the medium of film to make more of a political statement. The Wages of Fear is a suspense thriller unlike any other, putting desperate men into a life-threatening situation against the elements and against themselves. The film follows the lives of a group of down and out social rejects who take petty jobs in a run down South American village just to get by. Mario (Yves Montand), a con artist, learns of a job opportunity being given out by an American owned oil company and quickly seeks out the help of another con man, Jo (Charles Vanel) who has contact with the American contractor (William Tubbs) who’s hiring the men. Both Mario and Jo are chosen to drive a truckload full of heavily unstable nitroglycerin to a drilling site high up in the mountains to help stop an out of control oil rig fire there. To make matters worse, the drivers are given none of the safeguards necessary to make the cargo safer to transport, given the urgency of it’s need. With their deadly cargo, the truck drivers must take extra precaution as they trek their way over the mountains, which includes obstacles like numerous rock slides, precipitous cliff-side roads, and the occasional oil slick from a ruptured pipeline. Even a minor speed-bumb could prove deadly to these men if it causes the nitro to explode unexpectedly. Not only that, but they must work under a deadline in order to be paid the full amount they were promised and contend with another truckload driven by another crew; the German Bimba (Peter van Eyck) and the Italian Luigi (Folco Lulli). The remainder of the story follows the different trials that these drivers face while on the road, each becoming more perilous and heart-pounding than the next. Wages of Fear is a masterclass in suspense film-making and should be watched by anyone who loves heart-pounding action. What makes it particularly spectacular is the fact that Henri-Georges Clouzot utilized almost no trick photography during the making of this film. All of the most perilous moments in this movie, whether it be a huge explosion to clear a rock slide off a road, or a truck hanging perilously off of a cliff-side on a rickety, old platform, was done entirely on location. You have to wonder if Clouzot might have been a little crazy to put his actors in such perilous situations for the sake of each shot, but in the end, it does heighten the sense of realism that the movie has. They’re just lucky that Clouzot didn’t put real nitroglycerin in those trucks. Even still, the realism really heightens the cinematic experience that you’ll get from this movie. There are many moments that’ll make you wonder how they filmed that, to which the answer will probably be very, very dangerously. The realism also helps to underline the human condition that these men are put through, which underlines the political subtext as well. Some have claimed that the movie was anti-American, which I don’t really believe is the case, because nothing in the movie casts a negative light on American culture or government. Instead the movie is more of an accusation against the dehumanizing and sometimes unlawful practices of oil companies in developing nations. But to some, attacking oil interests was equivalent to an attack on the U.S., so the film was cut heavily on it’s American release. Looking at the film today, the cuts seem unnecessary and unfair, and Criterion has thankfully restored the movie to it’s appropriate length. A large reason why the film still resonates beyond it’s technical achievements is also because of the strength of the cast. Yves Montand and Charles Vanel carry the film significantly, and much of the films suspense is portrayed perfectly on their faces. You really get a sense of the toll that this perilous mission is taking on the men, as they begin to break down both mentally and physically. There’s an especially gruesome moment late in the movie when Yves’s Mario must decide whether or not to stop the forward progress of his truck through a waist deep pool of spilled oil in order to pull an impaired Jo out of harms way, or keep plowing through in order to avoid getting the truck stuck. The anguish on Yves face during this moment of decision is heartbreaking, especially when juxtaposed with the squeals of pain from Jo as the multi-ton truck crushes his leg. This scene is one of the most notorious in the movie and the chemistry between the two actors really sells the horrifying impact of the moment. There’s also a lot to say about Clouzot’s ability to sustain the tension in this movie. In all the film’s 2 1/2 hour running time, not once do you feel the movie drag. Every moment helps to ramp up the tension as the men head further away from the calm of civilization and deeper into an environment where even one bump in the road could mean immediate destruction. Many filmmakers have since been influenced by Clouzot’s unbelievable work in Wages of Fear, including Oscar-winning director William Friedkin, who himself tried to duplicate Clouzot’s masterwork with his very ambitious but flawed remake, Sorcerer (1977), starring Roy Scheider. Despite Friedkin’s best, and loving intentions, there is no comparison to the original. It was a product of a time when filmmakers pushed themselves to the edge only because it was the best way to capture reality, and not just because it would show off their talents as a filmmaker. 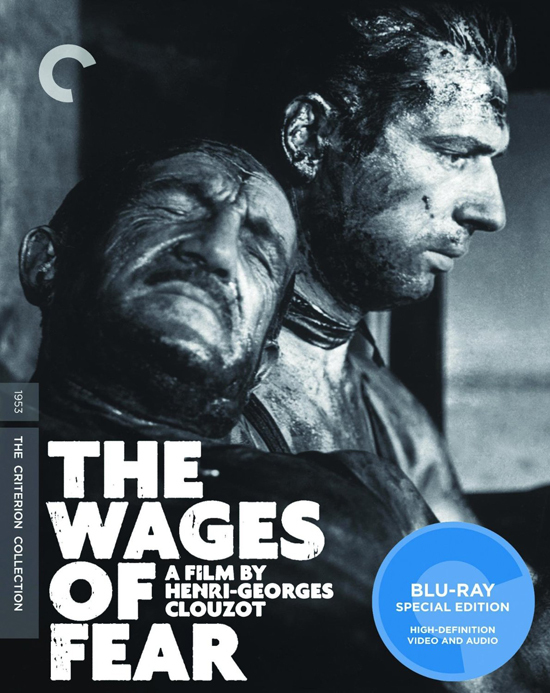 The Criterion edition of The Wages of Fear once again represents their strong commitment to preserving the classics of yesteryear and bringing them back to their former glory. While Wages of Fear is limited visually by the standards of the time that it was made, it has nevertheless been preserved well enough over the years in French film vaults, given it’s highly regarded status. Criterion helped to give the movie a fresh new transfer in high definition for this blu-ray release and the hard work shows. The black and white cinematography is beautifully realized in high definition, bringing out the stark contrasts between light and dark, which defines many of the film’s most tension filled moments. The high-def transfer also brings out the texture detail beautifully, showing every jagged rock and piece of rubble on that mountain pass as well every bead of sweat that runs down the faces of the actors. Clouzot wanted his film to reflect reality as best as it could and the on-location photography really shines through in this new transfer. And like I said before, this is the longer uncut version, and all the deleted material has likewise been seamlessly reincorporated back into the movie. The soundtrack, which was also limited by the technology of the time, has also been given a cleaned up transfer in this new edition. The Criterion blu-ray features an uncompressed monaural soundtrack free of pops and hisses and sounds very natural for a film of it’s age. For a foreign language black and white film made over 60 years ago, this is as good as you would expect from the people at Criterion. The extra features on this set aren’t quite as extensive as some of Criterion’s other marquee titles, but what is here is still appreciated. There’s no commentary track, but we are given a few interesting documentaries regarding the film and the people who made it. Probably the most substantial feature is a 2004 documentary called Henri Georges Clouzot: An Enlightened Tyrant, which details the life and career of the director. The feature is a fascinating look at a complex man who was a great artistic mind, but also someone who was known to be very hard to work with. There is also a really fascinating video essay called Censored, which details the different cuts made to the movie upon it’s American release. It shows the cuts themselves as well as details as to the specific reasons for why they were cut, like the already mentioned perception of anti-Americanism as well as some suggestions of homosexuality between the different characters. There are also interesting interviews with cast and crew included on this set, including a new one with Clouzot’s assistant director on Wages of Fear, Michel Romanoff, where he details the tumultuous filming on location in southern France. There’s also an interview with Clouzot biographer Marc Godin as well as an archive interview from 1988 with Yves Montand (who died in 1991), and how he viewed his experience making the film. Overall, a very nice collection of extras that add substance to this set and compliment the movie perfectly. The Wages of Fear was a groundbreaking movie in many ways and it has only gained more notoriety ever since it’s original release. Even when it first premiered back in 1953 it was seen as something special. It holds a special distinction of having won both the prestigious Golden Bear at the Berlin Film Festival and the Palm D’Or at the Cannes Film Festival, the first movie to ever do that. Even many years later, it’s influence is still being felt in gritty suspense thrillers from all over the world. Clouzot has rightly earned a reputation as one of France’s greatest filmmakers, although his gritty realist style fell out of fashion once his native country adopted the New Wave. But, even still, his work is right at home in any cinephile’s collection, and no more so than with The Wages of Fear. It’s cinematic suspense at the highest degree and much of it’s film-making wonder is still impressive to behold. Clouzot’s career was unfortunately brief, due to health complications that plagued him for his entire life, but with this and Diabolique, he thankfully won enough high praise to be considered a peer among the cinematic titans of his day. He didn’t earn the title of the French Alfred Hitchcock for nothing. The Wages of Fear is a movie that I recommend that every one should check out, especially if you’re looking for a good title to add to your Criterion collection at home. It once again shows how good Criterion is at keeping the works of the great cinematic masters of the past alive and relevant for modern audiences.